The hype is here! This is the second preview article for the semi-finals and final of the Summer Tournament happening this Sunday. Make sure to tune in for some university League of Legends. 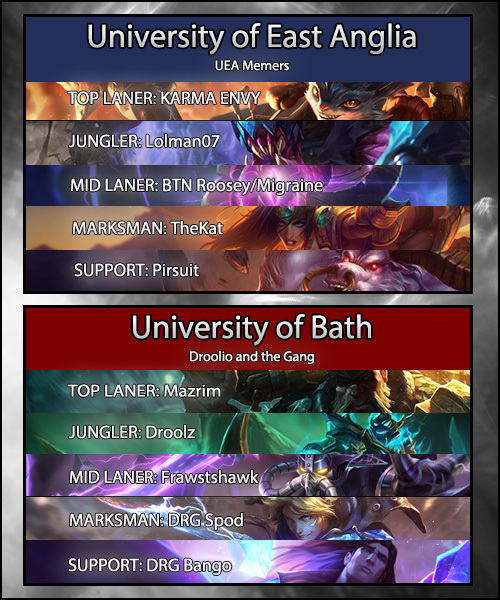 This semi-final sees Memers versus memers, uppercase versus lowercase, the UEA Memers against Droolio and the Gang. Here are your team profiles. The Memers claimed second position during previous weeks and thus held onto that final automatic qualification spot. With no Gauntlet to negotiate they could sit pretty for a week. They finished 5th in the regular season, but were beaten in the knockout stages by eventual finalists Cambridge Memers. They’re a strong team and appeared in the two previous weekly finals, beaten by the Aston Aunties on both occasions. They’re looking to negotiate a potentially tricky semi-final for another bite at the cherry. Roosey is capable of playing in the midlane as well as support as shown by his NUEL performances on Morgana and Vel’Koz. The Week 5 Final matchup saw him bring out the Gnar midlane resulting in much debate among the casting team. Sure, it wasn’t particularly successful and was probably more of a way to target Aston’s Matty Triceps and his champion pool, but the sentiment was there. He is more than capable of pulling something out of his sleeves. We’ll just have to see what it is. The AD half of the Memers botlane boasts a mean Sivir that is currently undefeated in the NUEL Summer Tournament and boasting an impressive 13.4 KDA (yes, I did search through his whole match history). His Ezreal is also no slouch while Vayne is known to make the odd appearance. Look out for these two champions during the semi-finals (and potentially final), though he may find himself pushed out of his comfort zone. A midlaner who takes his name from the primary headache disorder, he is perfectly capable of inflicting said disorder upon his opponents. He has had impressive performances on Cassiopeia in the Summer Tournament while his Zilean has a 76% win rate in ranked queues (though it has found slightly less success here). If he plays, he is one to watch with the ability to play assassins and control mages. Lolman07 is the jungle superstar of this team. Better known by some (very few) as the #777 best Corki in the world when not spending his time among the fauna (source: lolskill.net), he is a force to be reckoned with. While he seems to favour more team oriented, tankier junglers, Rek’Sai, Hecarim and Olaf to name a few, he is perfectly capable of carrying. With a combination of champions that can run over (or burrow under) a team, it will be a tough ask to keep him in check. In their matches, expect a proactive Lolman07 in the jungle. The semi-final may hinge on the matchup between Droolz and Lolman07. The Memers are a solid team with good players and multiple options. Their botlane may come under pressure in champion select, but with several players offering carry potential, this should not be too much of a problem… maybe. Droolio managed to negotiate the dreaded Gauntlet despite being seen by some as rank outsiders. They went into the Gauntlet as the fifth seed, but came out without a blemish, able to beat arguably bigger names on the circuit. Cue a celebratory video with highlights of their journey. Their reward was facing the second most fancied team over the first, not that they care. Droolio and his extraordinary gentlemen press onwards! Another toplaner heavily favouring carries, he is partial to both Fiora and Gangplank with Irelia making an appearance during the Gauntlet. A solid, but aggressive player that draws jungler attention from the opposition, don’t expect to see him on a tank. Jungler, captain and meme enthusiast with a name that apparently refers to the fact he produces a little too much saliva for his mouth to contain (fact or fiction, you decide). When he’s not covering his keyboard in digestive enzymes he’s a very proficient jungler to have on your side. He loves to be aggressive and disrupt the enemy team, as shown by his selection preference for Rek’Sai and Hecarim, the latter of which was showcased impressively in the team’s Gauntlet matches. However, Gragas and Nidalee are never far away and Olaf one click from a rogue appearance. With such a similar champion pool to Lolman07 of UEA, this could make for an intense matchup. One could argue Droolz’ pool is slightly deeper, but then again, that might just be a product of the drooling. The team’s midlaner, he has a versatile champion pool favouring Kassadin, Malzahar and Viktor with plenty more to come. Banning him out is a big ask, though his Kassadin during the Gauntlet was particularly threatening. It may not matter which midlaner he faces from the Memers. They might not be able to touch him. Spod is a name that inspires fear. Much like his opposite number his Sivir play has been on point recently, able to bag himself the champion in all of their Gauntlet games and only dying four times. This could see it become a priority pick with Ezreal and Lucian seeming to be his fallbacks. Again, much like Droolz, he shares a similar champion pool to his opposite number, but arguably with slightly more depth. Picks and bans could be interesting. Could his Jhin make an appearance? The curtain calls. Bango’s performance during the Gauntlet resulted in cries of “MVP” from Twitch chat. In three of their four games he secured himself Taric and was hugely influential for his team. In fact, he ended the Gauntlet with a KDA of 17 on the fabulously gemmed man, a solitary Bard game bringing down his average over the whole Gauntlet to 8.5 (for shame!). Nonetheless, he has a bottomless pool of supports to choose from with Braum, Alistar, Janna, pretty much anything. Expect big plays from the man. Twitch chat expects it. With the playmaking potential of Bango and Droolz, the Gang may see more of a bottom focused strategy. The bottom lane could be where it is won and lost, but with potentially both junglers drawn in that direction, Mazrim could have free reign to test KARMA ENVY. And with both teams having access to multiple carry style champions, how the side lanes play out could tell the true story of this game.